4 February 2010, at 11:01p.m. BELGIUM - Petersime has launched the S-line, its new range of single-stage incubators to maximise the economic returns for hatcheries. 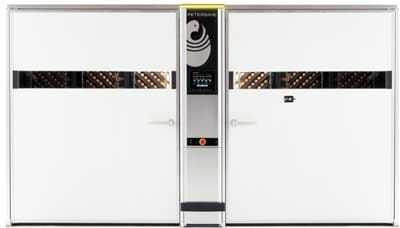 The S-line sets new standards in incubation. It optimises hatchery performance by hatching more but also better quality chicks and by reducing energy, maintenance and labour costs. Petersime has developed this new range in answer to the actual market needs of hatcheries that want to maximise their economic return. Increasing competition in the poultry market and pressure on prices are driving hatcheries to maximise their production. But that's not all. Reducing energy consumption, for instance, has become increasingly important. Not only to reduce costs, but also to limit the carbon footprint. It's an aspect that’s gaining importance in the poultry sector. In answer to these varied needs, Petersime has developed a new line of setters and hatchers that help hatchery managers increase their hatchery’s profits. The performance of the S-line is outstanding as it fully exploits all current technologies. The advanced Embryo-Response IncubationTM technologies ensure improved hatchability and better chick performance, the intuitive user interface makes the S-line easy to use, and the Eco-DriveTM technology provides energy savings of up to 50 per cent. All S-line models have been designed for an extensive lifetime and are future proof. The material is durable and easy to clean and maintain. The S-line can be adapted easily to future requirements because it uses an intelligent controller with an open architecture based on industry standards. Geert Callens, Strategic Business Development Manager at Petersime explained: "With the S-line, you always have at your disposal a state-of-the-art incubator, whether it is today or in 25 years." The entire S-line reflects a profound understanding of all aspects of the incubation process. Petersime has clearly valorised its extensive experience of its well-known AirStreamerTM incubators and its knowledge based on the study of numerous field data. Geert Callens added: "However, we don't rely solely on our own experience. We have also tested extensively the performance of the S-line in the field through various pilot cases at our customers' hatcheries. This has enabled us to ensure that the expectations are fulfilled." The S-line is available in two product ranges: AirStreamerPlusTM and BioStreamerTM. The AirStreamerPlus is the standard version and includes all the essential functionalities of a modern state-of-the-art single-stage incubator. The BioStreamer adds an advanced user interface and autopilot functionality based on Petersime's patented Embryo-Response Incubation technology.